What about pilgrimage helps you let go of fears and find peace that passes understanding? How can you be still and hear God’s voice as you trek the ancient pilgrimage route? How will you prepare your heart for a closer walk with God on El Camino? Find answers to these and other questions in Spiritual and Walking Guide: León to Santiago, a daily devotional and walking guide. How to follow the route without maps. Here then is a guide ideally suited to you, the pilgrim, who is seeking direction, both spiritually and geographically while walking El Camino from León, Spain to Santiago de Compostela. With space to journal thoughts and revelations, you’ll hold onto this book as a keepsake of your pilgrimage along The Way for many years to come. 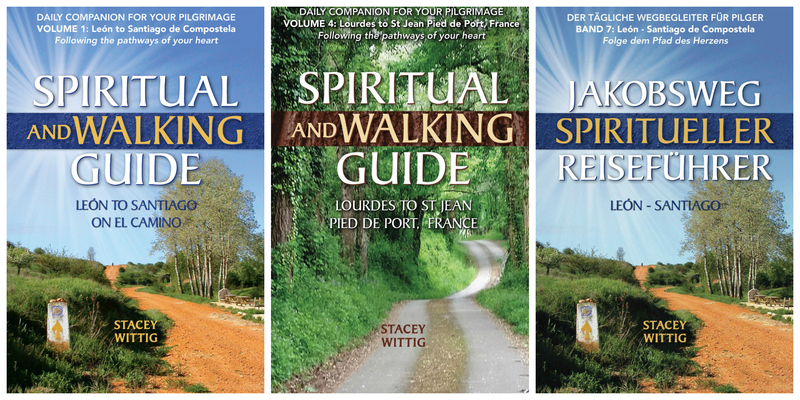 The three-in-one book by award-winning travel writer, Stacey Wittig, offers daily devotionals with scriptures for The Way and thought-provoking questions, space to journal, and a walking guide. If you are starting your Camino pilgrimage at León, Spain, or a place west of León, then this is the book for you. Click here to learn more or buy now. Belleville, Ill — American Pilgrims on the Camino gathering participants had rare opportunities to review and hear excerpts from the Camino’s most recent walking guide last week at The National Shrine of Our Lady of the Snows. Spiritual and Walking Guide: León to Santiago on El Camino, a guidebook that combines Christian daily devotionals with a walking guide for the Camino de Santiago pilgrimage route in northern Spain, was unveiled at the annual gathering. 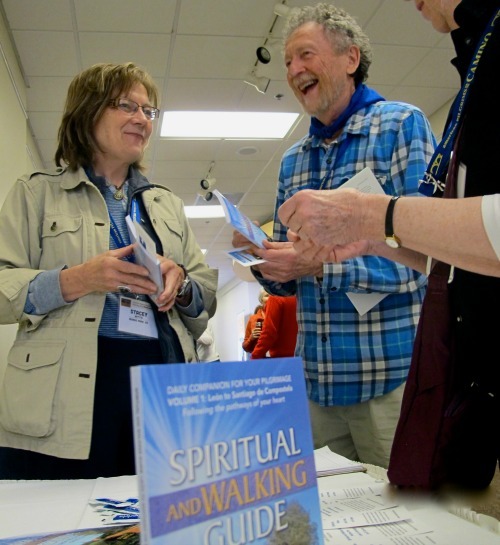 Meeting American Pilgrims on the Camino (APOC) at book table at 2014 gathering. Stacey Wittig (L) and Gary Mitchener. The dimensions of the small book were designed to fit conveniently in an outside pocket of the pilgrim’s backpack; it is, of course, light weight. The book is also available in Kindle and eBook versions for those who would rather read it from their tablet or smart phone. Gathering attendees at The National Shrine of Our Lady of the Snows also heard Wittig read one of the daily Camino devotionals at the end of the “Camino Cabaret,” a talent show which has become a tradition at the annual gatherings. The 2015 Annual Gathering of Pilgrims will be held in Menlo Park, Calif. on March 12-15. Learn more about the Spiritual and Walking Guide: León to Santiago on El Camino by clicking HERE.